Our family, like so many these days, was a blended family…sorta. My ex-husband and I had 5 children. He had a daughter, Lisa, and two sons, Jeffery and David, from a previous marriage whom I adopted and I had a son, Jeremy, from a previous marriage whom he adopted and we had a daughter, Kaylie, together. Jeffery Lee Hartley: Born February 17, 1983, in Eagle Lake, TX, was our oldest son by four months and second child. Jeffery became mine at the age of three and let there be no question about it, he was mine! My quiet, level-headed child, with my dry sense of humor. A plugger; once he put his mind to something he kept at it until it was done and done well. He was an A/B student, but he worked for those grades. He competed in an UIL band competition (trombone) in the 8th grade with a broken arm. He played football and was a member of the power-lifting team in high school. He also held down a part-time job. All his accomplishments were on his own and because of his wonderful character. He joined the Army at the age of 17 in his junior year of high school, but couldn’t actually enlist until he graduated. His adopted brother, Jeremy, was going to enlist with him, but passed away from an unknown heart condition before he could do so. Jeffery never fully recovered from his brother’s death. Their kindergarten teacher described them as close as a set of biological twins she had in the same class. Where you saw one you saw the other. Jeffery continued with his plans, joined the Army, then 9/11 happened. 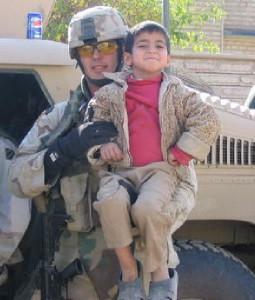 He became a Ranger, did two tours in Iraq, one tour in Afghanistan, anther tour in Iraq and was on his fifth tour, again, in Iraq when his vehicle was hit by an IED on April 8, 2008. His last tour was different. It was the only time he kept saying, “I just wanna come home.” The war changed Jeffery. He was always my laid back, hard to ruffle kid. It left its mark; hard edges and a callousness in certain areas I wasn’t used to in my soft-hearted son. Yet, he continued to put others first, especially those in his unit. He made his men feel like family I’m told. Jeffery earned eight Army Commendation Medals; one with valor, two Bronze Stars; one with valor, and two Purple Hearts. His call sign was Protector 6, and that was appropriate for the boy, the son, the brother and the man he was. He leaves behind his father and step-mother, his sister, Lisa, now 33, married with two sons, his brother, David, now 29,engaged with a daughter, his sister Kaylie, now 26 and me, his mom. Plus all the lives he impacted in the 25 years we were given the gift of him.